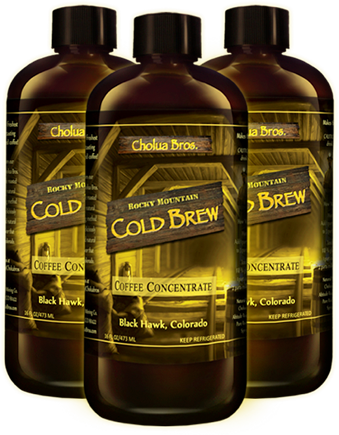 Simply the best Cold Brew Coffee you’ll ever taste, period! Our Cholua Bros. Cold Brew Coffee Concentrate is made using our legendary, high-altitude roasted coffee and pure Rocky Mountain Spring Water. Our cold brewing process creates deliciously smooth and natural cold brewed coffee flavor with low acidity that is as crisp as a Rocky Mountain morning. Use Cholua Bros. Cold Brew Coffee Concentrate to make delicious iced coffees or smooth full-bodied hot coffees. Toss it in a cooler and take it anywhere. It can even be used as a mixer with your favorite spirits.